RACHEL LEONARD: SYLVIA WEINSTOCK, MY FAVORITE CONFECTIONS GENIUS IN THE WORLD. I LOVE THAT THIS IS YOUR SECOND CAREER. WHAT MADE YOU BECOME A CAKE BAKER? SYLVIA WEINSTOCK: WELL, I’M A FOODIE AND I FIND THAT CAKES WERE EITHER DRY AND BEAUTIFUL, OR WERE DELICIOUS BUT HAD ABSOLUTELY NO LOOK TO THEM. SO I FIGURED THERE MUST BE A WAY TO MAKE A DELICIOUS CAKE THAT WAS ALSO BEAUTIFUL. AND I THINK CAKE IS ONE OF THE HIGHLIGHTS OF AN EVENT; IT CERTAINLY IS THE LAST THING AT A PARTY THAT YOU GET TO EAT SO IT'S MEMORABLE. 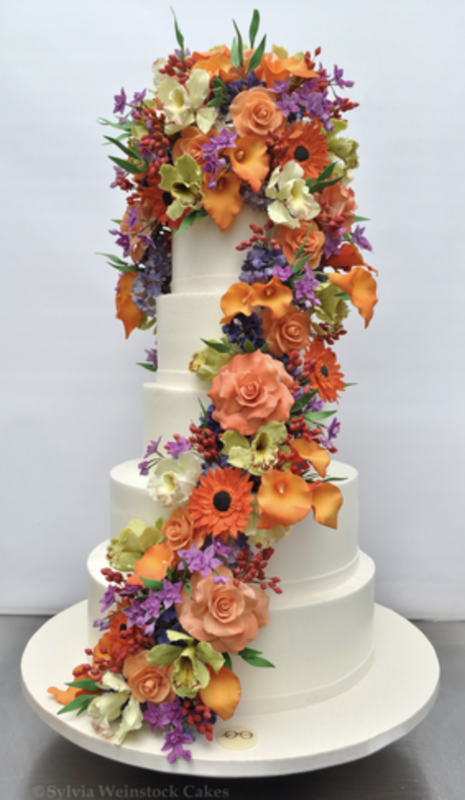 RL: OKAY, AND WHAT INSPIRES YOUR CAKE DESIGN? SW: WELL, I USED TO BE A GARDENER AND I LOVE FLOWERS AND I WOULD TRY TO SIMULATE AND DUPLICATE NATURE'S REAL FLOWERS IN SUGAR. THEN IN TERMS OF DESIGN, THEY’RE ALL OVER—EVERYTHING-- WHETHER IT’S THE ROOM, THE GOWN, THE DÉCOR, THE SEASON, SOME ELEMENT THAT I CAN TRANSLATE ON A CAKE FOR ITS DESIGN. RL: WHAT’S YOUR FAVORITE TYPE OF CAKE ASSIGNMENT? SW: I THINK MY FAVORITE WOULD BE A BRIDE WHO IS CREATIVE AND WILL EXPLORE WITH US A DESIGN THAT MIGHT BE VERY UNIQUE AND HAS NEVER REALLY BEEN DONE FOR A CLIENT. I PREFER THAT RATHER THAN JUST STAMPING OUT THE SAME THING OVER AND OVER AGAIN. 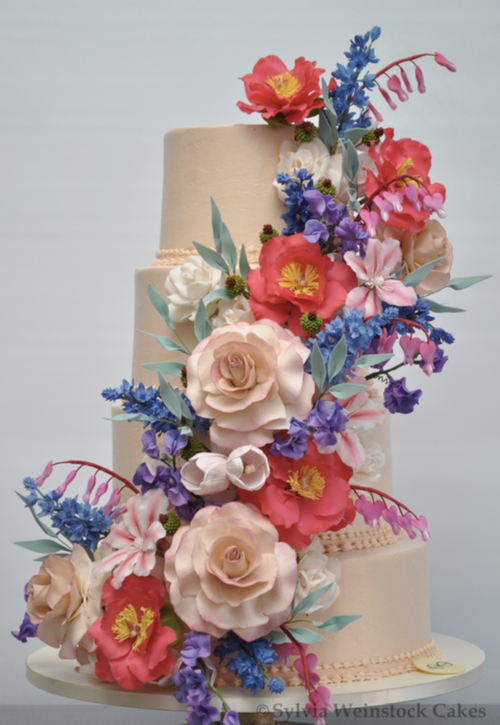 RL: WHAT ARE THE TRENDS TODAY IN WEDDING CAKES? SW: I THINK WE’RE FINDING PEOPLE MORE INTERESTED IN A DELICIOUS CAKE, ONE THAT IS APPROPRIATE FOR THE OCCASION. SOMETHING THAT IS BEAUTIFUL AS WELL AS APPROPRIATE FOR THE ROOM, THE SEASON, THE PALETTE OF THE GUESTS. PRETTY MUCH THOSE WOULD BE THE TRENDS. RL: OKAY. SUPPOSE SOMEBODY ORDERS A CAKE IN L.A., OF COURSE HOW DO YOU DELIVER THOSE? SW: WE SHIP CAKES OVER BUT THEY HAVE TO BE A DIRECT FLIGHT. THEY FLY OUT OF NEWARK OR JFK AND THEY HAVE TO HAVE A DIRECT FLIGHT FROM OUR SITE TO WHERE SOMEBODY WILL PICK IT UP ON THE OTHER END. RL: AND DO YOU INSTRUCT THE PILOT? SW: OH, FREQUENTLY! IF I’M ON THE PLANE I TELL THE PILOT “WE’VE GOT A WEDDING CAKE IN CARGO, KINDLY LAND GENTLY”. RL: AND THEY ALWAYS LISTEN TO YOU? SW: THEY ALWAYS SAY "YES, THAT’S VERY CUTE". 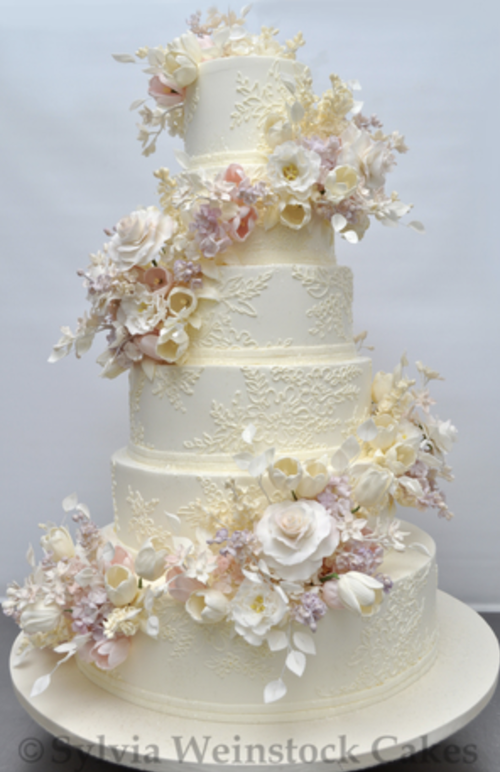 RL: WHAT’S THE MOST MEMORABLE WEDDING CAKE YOU’VE EVER MADE? I DON’T THINK YOU REALLY LIKE ANSWERING THAT QUESTION BUT GO AHEAD. SW: YOU KNOW WHAT THE ANSWER IS? HAVEN’T DONE IT YET. RL: I LOVE THAT. WHAT’S MORE IMPORTANT: TASTE OR DESIGN? SW: I THINK BOTH, DESIGN AND TASTE. I DON’T WANT TO DISAPPOINT ONE OVER THE OTHER. MY STORY, THE ONE ABOUT THE PEACH, YOU HAVE THIS BEAUTIFUL, FUZZY, DELICIOUS, SUCCULENT LOOKING PEACH THAT YOU BITE INTO AND IT TURNS OUT TO TASTE LIKE A POTATO AND YOU THROW IT AWAY. YOU’VE ALREADY FORGOTTEN WHAT IT LOOKED LIKE AND YOU CERTAINLY DIDN’T LIKE THE TASTE. SO IT HAS TO BE BOTH, DESIGN AND TASTE. RL: WHAT’S THE DIFFERENCE BETWEEN THE BRIDE AND GROOM TODAY? SW: WELL I THINK TODAY OUR BRIDE IS A LITTLE OLDER, SHE’S A CAREER PERSON GENERALLY SPEAKING, SHE’S BEEN TO A NUMBER OF WEDDINGS AND EVENTS SO SHE’S A LITTLE MORE SOPHISTICATED AS TO WHAT SHE WANTS IN THE WAY OF A WEDDING CAKE. RL: SHOULD THE CAKE COORDINATE WITH THE SCENE, DRESS, LOCATION? SW: WELL I THINK IT SHOULD BE APPROPRIATE FOR THE SEASON AND THE LOCATION. I MEAN YOU DON’T WANT TO PUT A MINIMAL, ASIAN, SIMPLE-LOOKING CAKE IN A VERY ORNATE BALLROOM NOR DO YOU WANT A VERY TALL CAKE THAT YOU HAVE TO SQUEEZE IN TO AN 8-FOOT CEILING ROOM. RL: WHO WAS THE LAST CELEBRITY THAT YOU MADE A CAKE FOR? SW: WELL WE MADE A CAKE FOR SOFIA VERGARA WHO I THOUGHT WAS JUST ABSOLUTELY LOVELY. THAT WAS LAST BUT WE HAVE SEVERAL MORE ON THE BOOKS FOR THE FUTURE. RL: OF COURSE YOU CAN’T SAY WHO, RIGHT? SW: NOT UNTIL ITS OVER, IF THEY GIVE ME PERMISSION. RL: IF THEY GIVE YOU PERMISSION. SW: BECAUSE WE SIGN CONFIDENTIALITY AGREEMENTS. IN THIS CASE WITH SOFIA, SHE TOOK IT AND RAN WITH IT. BUT, FOR MOST CELEBRITIES WE DO SIGN SOMETHING—AND FOR SOME CATERERS OR PARTY PLANNERS, THEY JUST DON’T WANT IT. THEY SAY THEY DON’T WANT CAMERAS BUT THEY PUT IT OUT ON THE INTERNET THEMSELVES. SO MUCH FOR CONFIDENTIALITY. RL: EXACTLY, IT'S ALL ABOUT INSTAGRAMMING. SW: BUT IT DOESN’T COME FROM US. WE ARE DISCRETE ABOUT OUR CLIENTS. SHOULD THEY WANT TO PUT IT OUT TO THE WORLD TO KNOW, THAT’S THEIR PREROGATIVE. SW: YOU GOT IT, KIDDO.